Add a security lock to your new MacBook Pro to ensure it isn't an easy target for coffee shop con men. 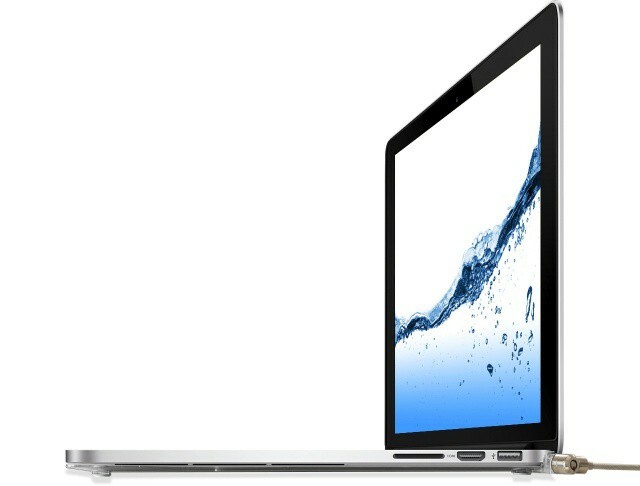 In an effort to create the thinnest, lightest MacBook Pro it has ever released, Apple did away with a number of features that MacBook Pro users have become accustomed to, including the Kensington security lock. That means, of course, that you can no longer secure your $2,800 notebook to a table in Starbucks, and that it could easily be stolen from right under your nose the second you get up to order another cappuccino. But Maclocks has a solution: the world’s first MacBook Pro security case and lock. The Maclocks security case is a lot like other snap-on shells that you might apply to your MacBook Pro for protection, only it features a built-in security lock that allows you to add a strong steel cable lock; it can’t be swiped off the table in your local coffee house. “Once the case and cable are locked together, it’s hard to detach the case without damaging the MacBook Pro,” Maclocks promises. The case is lightweight at just 0.35 pounds, and it includes all of the features you’d expect from a protective cover, including air vents to keep your notebook running cool. You can pre-order the bundle — that’s the case and the cable — for $69.95 today. Shipping will begin “within 6 weeks,” which means you will have to stay inside and make your own coffee for a little while longer.